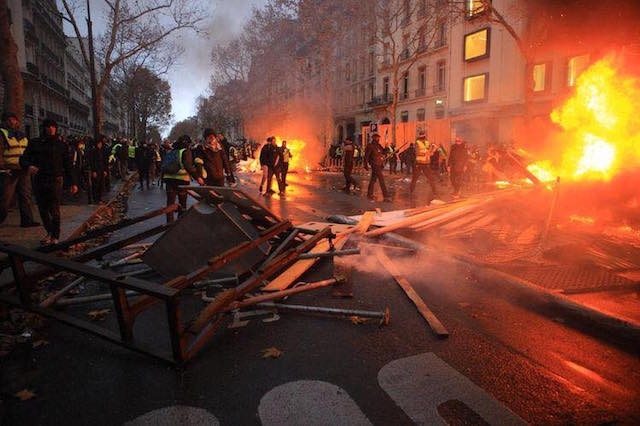 USPA NEWS - Extreme violence erupted in Paris between vandals "wearing yellow vests" and inflamed in other French cities, the capital Saturday, December 2. A chaotic situation that looks like a civil war, results in a heavy balance sheet. 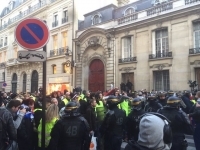 According to a first assessment 136 00 people participated in yesterday's movement, with a heavy toll with 412 arrests and hundreds of wounded. Of the 379 people in custody, there are 33 minors ... 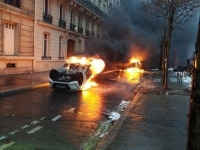 This dark day, resulted in scenes of guerrillas, worthy of civil war, and has resulted in multiple incidents and violence in France, especially in Paris. 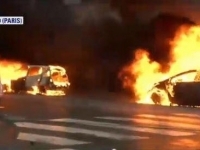 In the capital, clashes between vandals and police, have made a hundred wounded, including 23 among the police. 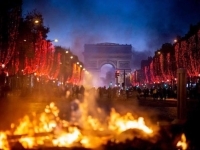 The Yellow Vests were blocked at the Place de l'Etoile (end of the Avenue des Champs Elysee) by the forces of the Order and inciting them remained facing the Round Point of the Arc de Triomphe. 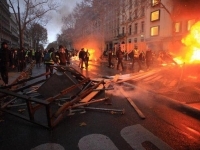 Extreme violence erupted in Paris between vandals "wearing yellow vests" and inflamed in other French cities, the capital Saturday, December 2. A chaotic situation in the shape of a civil war, results in a heavy balance sheet. According to a first assessment 136 00 people participated in yesterday's movement, with 412 arrests and hundreds of wounded. Of the 379 people in custody, there are 33 minors ... 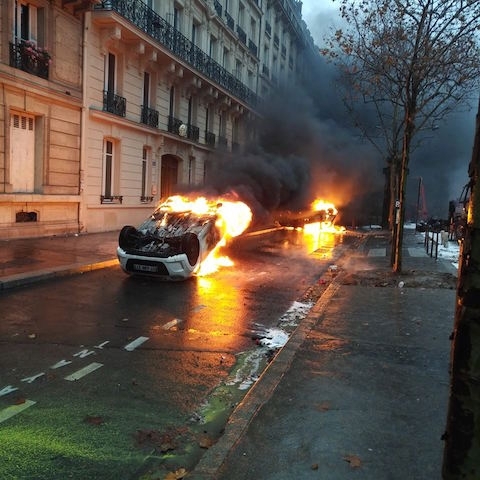 This dark day, resulted in scenes of guerrillas, worthy of civil war, and has resulted in multiple incidents and violence in France, especially in Paris. 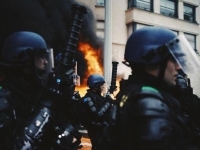 In the capital, clashes between vandals and police, have made a hundred wounded, including 23 among the police. 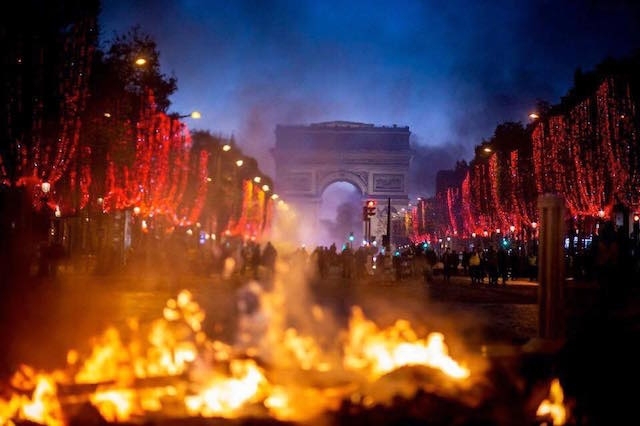 The Yellow Vests were blocked at the Place de l'Etoile (end of the Avenue des Champs Elysee) by the forces of the Order and inciting them remained facing the Round Point of the Arc de Triomphe. 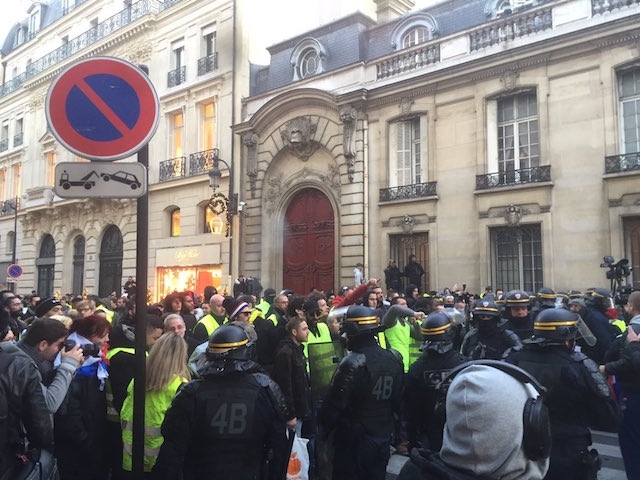 At around 8:00 am, chartering with the police started already very early, with projectile jets on one side (Vandal Yellow Vests) and the big tear-guns (Police officers, CRS). 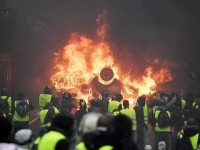 The damage was very massive and impressive, because "Vandal Yellow Vests" caused 249 fires, burned 112 cars fires, including 30 urban and 6 buildings that were fires. according to the Prefecture Ile De France. 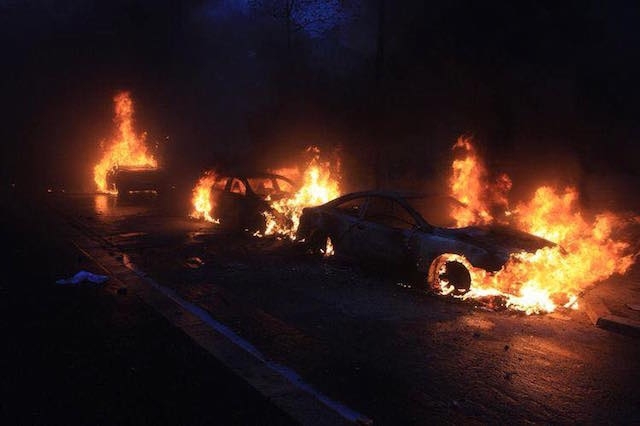 The cars that were burned were targeted at luxury brands (Porsche, Mercedes ...). 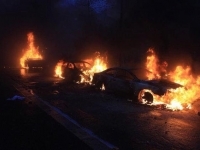 Bank distributors, cash machines, and shops were ransacked and looted. 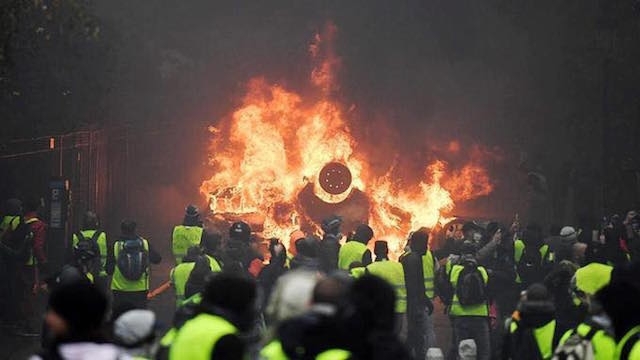 The most shocking is the attack of the Arc de Triomphe from the outside, even from the top of the veterans monument, as well as the interior or objects of the shop, including the broken Marianne statue, symbol of the Republic. French. Outside the Place de l'Etoile, the Arc de Triomphe, other hotspots and symbolic of the department stores, and luxury shops were ransacked, as the Place Vendome, or the jewels, were vandalized, the Boulevard Haussmann, close to Grand Magasin Spring, Galeries Lafayette, Avenue Kleber, and even the pharmacy of this avenue, known for being rich. 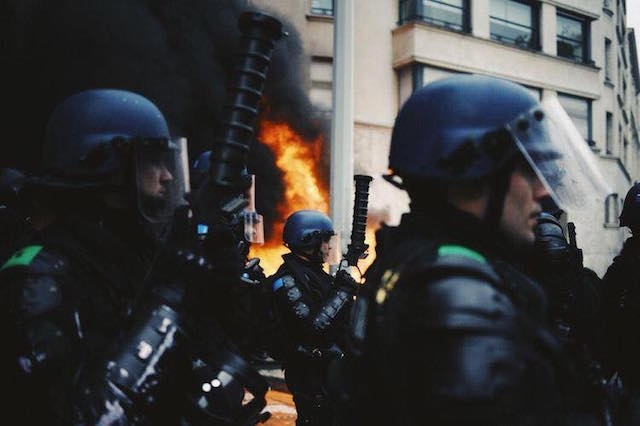 One particular hotel, was set on fire, by the Vandals Yellow Vests, or the firefighters were refluxed by the same authors of this incident preventing intervention. 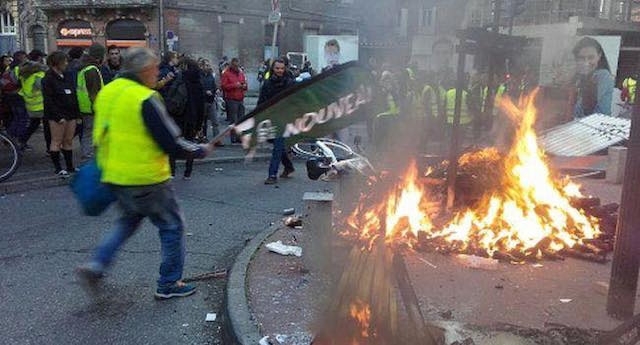 In short an anger, even a rage and a desire to destroy everything has spread in a few hours in Paris 8th, 9th and 16th, rich districts (Palce Vendome, Opera, Boulevard Haussman, Saint Lazare, Avenue Foch, Avenue Kleber, Avenue Grande Armee...) where the "Vandals Yellow Vests" offered a distressing and distressing spectacle on the sidelines of the event Peaceful Yellow Vests that at the same time shouting their silent demonstration towards Bastille, Republic, and even singing their demands on the abolition of carbon and other taxes, as well as the resignation of Macron for others and the dissolution of the assembly , or rebuff the ISF (Tax on Fortune, suppressed by the Macron government). STRATEGY OF POLICE SERVICES NOT SUITABLE FOR VIOLENCE OF BREACHERS-------------------------------------- The Prefect of Police Michel Delpuech, explained at the Press conference that : This is an unprecedented situation, with "degrees of violence never so serious" and "intensity not seen for decades, said the Prefect of Paris, Michel Delpuech.The District Attorney, and Interior Minister Christophe Caster, agreed with this unprecedented violence ever seen in France, with such anger, extreme rage and highly destructive.--------------------------------------------------------------------------------------------- The mayor of Paris 15, Philippe Goujon, explains on France TV that: "Out of 48 forces mobilized, only seven were mobile for the Place de l'Etoile with CRS companies. 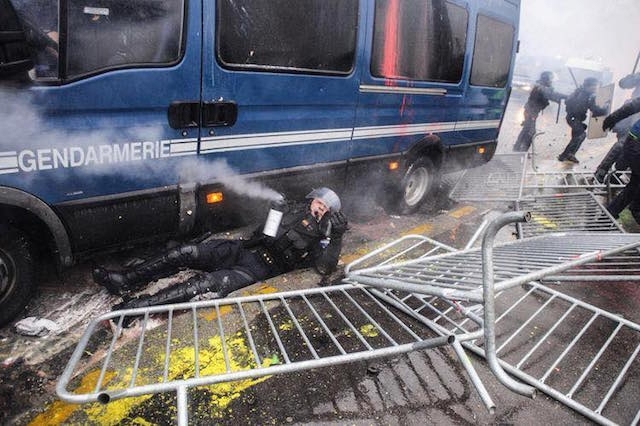 The principle of keeping the police in the French to keep protesters at a distance, at the Francise, it would have needed the police in contact with the vandalises. Those who were challenged are those who "run the least quickly" while the most seasoned sit go quickly and left. 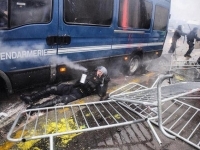 The police force does not have enough means to keep the crowd away, (Flashballs ...), explains that the vandals already known to the police could have been apprehended quickly and judge immediately. 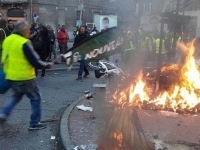 And there was strength to protect National Assembly and Senate, and mayor of Paris, could have been used after military, as the military and do the guard. If the police are not able to put in place a correct strategy, we can not continue with events that will increase from Saturday to Saturday. "Explained Philippe Goujon Mayor of Paris 15th.